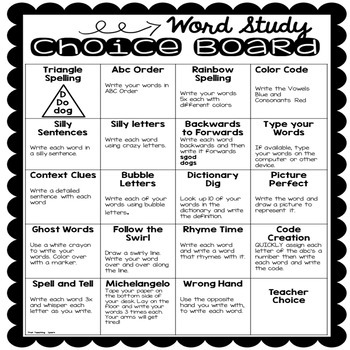 Needing something simple yet fun for your kiddos to get excited about Spelling time again! 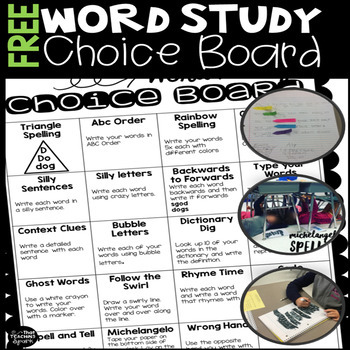 Grab this FREE Choice Board. Teacher tested and kid approved! 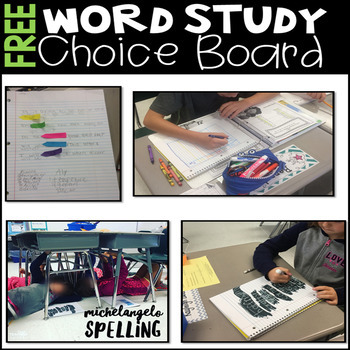 I created the Michelangelo Spelling activity after our art teacher did a project with my kiddos about the Sistine Chapel. My kiddos LOVE taping their paper to the underside of their desks and “painting” like Michelangelo. Of course, they are just writing their spelling words, but it is incredibly motivating. My kiddos also love Ghost Spelling. They write their words on paper with a white crayon and then color over the crayon with a marker. It “magically” shows up. Another favorite of mine is Context Clues. Students must write a sentence with the word that is so detailed, that another student could figure out the word if the word was covered up. I use the little sticky flags for this activity. Interested in the rest of my Spelling Program? Check out….